The KONG HandiPOD Starter Kit is the perfect tool for going for a calm and safe walk with your pet. This starter kit contains interchangeable components, including a poop bag dispenser, a powerful torch and disinfectant hand gel. You can use the poop bag dispenser on its own or in combination with the gel or the torch. When you go for a walk with your dog, you want that walk to be calm and safe. The HandiPOD Starter Kit from KONG can help you with that! This starter kit contains interchangeable components, including a poop bag dispenser, a powerful torch and a disinfectant hand gel. The bright torch will mean that you can see well at night, while the fresh hand gel will keep your hands clean. Accidents with poop bags and handling tennis balls covered in drool in the park are a common occurrence! The poop bags included are biodegradable and have handles. You can use the poop bag dispenser on its own or in combination with the gel or the torch. The HandiPOD is also available as a mini variant. The HandiPOD can be used as a poop bag dispenser on its own or in combination with the gel or the torch. A mini variant is available for small to medium-sized dogs. 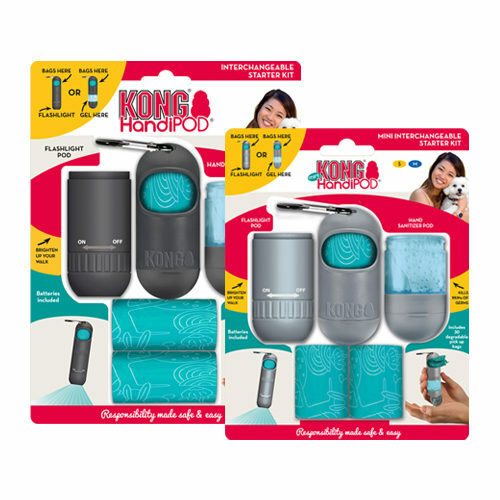 Have you used KONG HandiPOD Starter Kit before? Let us know what you think about this product.